A Chinese startup that wants to rival Tesla has gone public in New York. But the young company has a long way to go to catch up with Elon Musk. Like other high-profile Chinese companies that have gone public recently, Shanghai-based Nio (NIO) has had to scale back its ambitions for its IPO. It raised $1 billion from the offering, well short of the earlier $1.8 billion target Nio had set. The stock was priced at $6.26 per share, just a cent above the bottom of the range Nio was hoping to achieve. It quickly fell below $6 when it began trading on Wednesday, but later bounced back to close up more than 5% at $6.60. The IPO valued the company at $6.4 billion. The company, which was founded only four years ago, is attempting to take on Tesla (TSLA) in China, the world's biggest electric vehicle market. 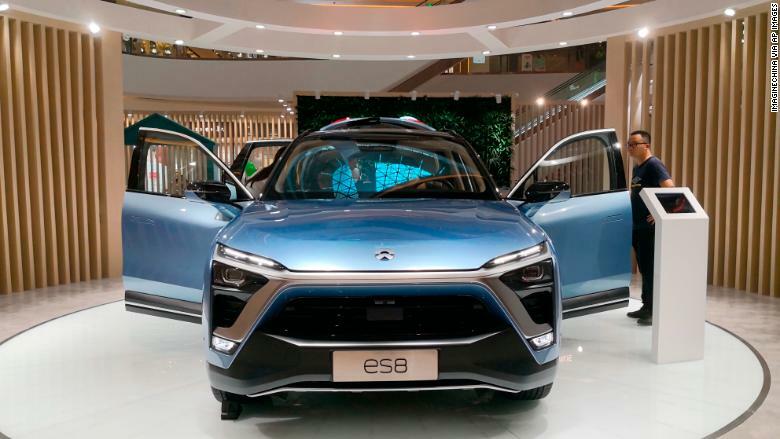 Its ES8 electric SUV, which was unveiled last year, sells for about $65,000, or about half the price of the most basic version of Tesla's Model X in China. "They've got the first mover advantage," said Tu Le, founder of consulting firm Sino Auto Insights. "This is the first Chinese company that wants to be the Tesla killer." 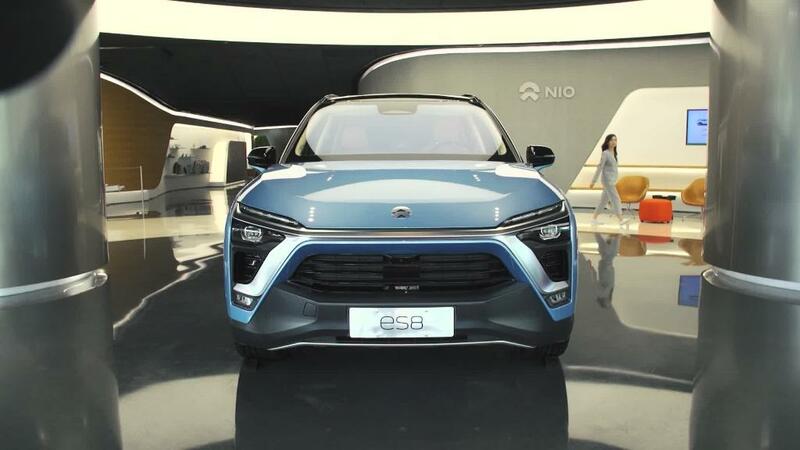 Nio's ES8 electric SUV sells for about half the price of the most basic version of Tesla's Model X in China. That's easier said than done in China's already crowded market. As well as Tesla, Nio faces competition from Chinese manufacturers including Warren Buffett-backed BYD (BYDDF) and Byton. Global carmakers including Volkswagen (VLKAF) and Ford (F) are also ramping up plans to develop electric cars specifically for the Chinese market. Nio intends "to compete with Tesla at a somewhat more affordable price," said Bill Russo, founder of Shanghai-based consulting firm Automobility. It's seeking to attract younger drivers with features like internet connectivity and artificial intelligence, he added. Nio has wealthy backers including Chinese tech companies Tencent (TCEHY) and Baidu (BIDU), but its operations are still small scale. At the end of July, it had 17,000 vehicles on order from customers, but had delivered fewer than 500, according to a regulatory filing for its IPO. In the first half of this year, it recorded just $7 million in sales, posting a loss of $503 million. 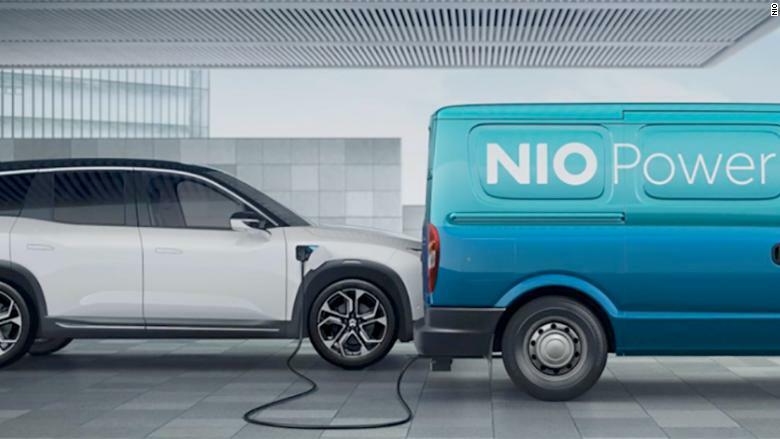 An artist's rendering of Nio's plan to use vans that function as mobile charging stations. By comparison, Tesla already has about $2 billion in annual sales in China even though its US-made vehicles face hefty import tariffs. Musk's company is aiming to build a factory in Shanghai that will eventually manufacture as many as 500,000 vehicles a year. Nio, meanwhile, could struggle to stand out from the crowd. "If you look at the car, it's no different from any other vehicle right now," Le said, referring to the ES8. Nio's business model could also be a disadvantage. Rather than making its own vehicles, it outsources manufacturing to an established Chinese car company, Anhui Jianghui Automobile Group (JAC). Nio focuses on developing technology such as an in-car artificial intelligence system and a charging system that it says will let drivers change their car batteries in just three minutes. The company's lack of direct control over the vehicle manufacturing makes it harder to maintain quality and respond to changes in consumer tastes, according to Le. The company is unable to get a license to open its own factory because it doesn't sell enough vehicles yet, he said. Nio's senior executives have big ambitions, though. President Lihong Qin told CNN in December that it wants to "target the middle class in the big cities in China," predicting that market will double in size in the next few years. Nio also wants to eventually expand sales beyond China, including to the United States. It already has offices around the globe, including in California, London and Munich.